Coming Sunday: Student-led protests and calls for greater gun control have increased, with some of the young activists saying their voices will be heard in election outcomes. While public and private schools look for ways to protect students from mass shootings and other violence during weekdays, there is also a need to secure buildings after school hours and on weekends. This fall, several shootings occurred at or near high school football games across the country. Injuries or fatalities from shootings occurred in Jacksonville, Florida; Fairfield, California; and Wellington, Florida. In other incidents, games were canceled due to gunfire at close range or the threat of it, according to news reports. Gun violence has erupted at various school venues, but officials in Allen County say that nightmare hasn't occurred at any of their schools and they are taking steps to prevent it. To keep tabs on student activities, the school districts employ school resource officers who work with school guidance counselors, teachers and other administrators to track potential trouble. To ramp up security at outdoor events, off-duty police officers are hired. At Southwest Allen County Schools, off-duty police staff extracurricular activities, providing crowd control and traffic assistance. The district hired its first school resource officer, often referred to as SROs, in 2003 and now has two, one with a police dog, said Stacey Fleming, SACS spokeswoman. While school resource officers are police officers assigned by the department to a school full time, off-duty police officers hired to supervise an event are paid separately. At Fort Wayne Community Schools, resource officers work in seven middle schools and Wayne High School, the only FWCS high school outside the city and therefore eligible for a resource officer provided by the Allen County Sheriff's Department, Krista Stockman, FWCS spokesperson, wrote in an email. At Snider, South Side, North Side and Northrop high schools, security teams with off-duty police officers work at the schools. “We have had SROs or something similar for about 20 years,” Stockman said. Uniformed police officers provide security at all FWCS football games. “We rely on their expertise in event security, in addition to having numerous school staff members working the games,” Stockman said. Northwest Allen County Schools has three full-time school resource officers, spokeswoman Lizette Downey said. Downey said she was not able to provide district protocol for after-school activities, but she did say security costs at Carroll High School games increased nearly 17 percent this year compared with the last school year. “Security costs have increased simply because we have tripled the number of safety officers we maintain on school grounds. Costs have risen proportionate to general inflation,” Downey wrote. EACS regularly confers with the National Center for Spectator Sports Safety and Security headquartered at the University of Southern Mississippi. Jeff Studebaker, former EACS school safety manager, has been involved in coordinating regional security training for the Indiana School Safety Academy in Indianapolis. 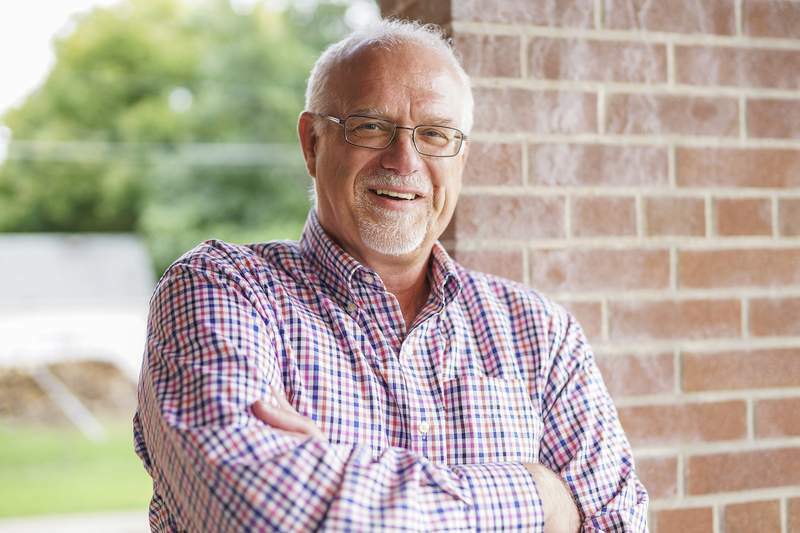 He recently accepted a security job with the Indiana Department of Education after holding leadership positions at the Allen County School Safety Commission for five years. The national Spectator Sports center was created in 2006, about the same time as the U.S. Department of Homeland Security, and sponsors safety conferences and issues certifications in school security. Although Lou Marciani, director of the national center, says Indiana is ahead of the curve when it comes to school safety, Studebaker says more needs to be done at extracurricular events other than football, basketball and track. “There's not a lot of security that goes on in those events. That's what our district committee wants to look at,” Studebaker said. This year, the Indiana Department of Education issued the 2018 Indiana School Safety Recommendations, a 133-page report focusing on safety during the school day. The report strongly recommended more mental health services, including adding community mental health centers and training staff to recognize signs of mental distress. The report also includes several recommendations for after-school events involving community organizations and sporting events. Of the six recommendations, two addressed severe weather, one addressed concussion protocols and two others addressed posting policies and safety procedure announcements. 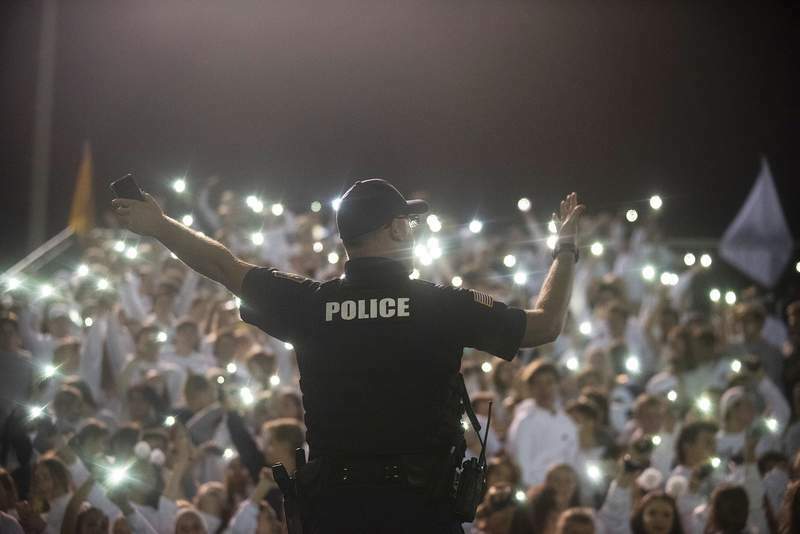 While some people are nostalgic for Friday night lights, frost in the air, high school cheers and homecoming dances, school safety experts say it's a new era. EACS now requires clear or mesh backpacks at school and outdoor events, even though enforcement is not consistent, Studebaker said. With three officers at a game, one officer is assigned to the parking lot. Officers at the game are required to watch the crowd, not the game. Additionally, off-duty police officers, often parents, from any law enforcement agency are asked to “carry,” or bring their weapons, Studebaker said. Parent groups are crucial. Studebaker cited Dads of Heritage, a volunteer group that helps provide security at Heritage High School functions. “They're a neat little grassroots group that comes together. They wear the same colored shirts, and people know who they are,” Studebaker said. Schools should have a school safety coordinator, not just for the school day, but also to look at risk and vulnerabilities for after school, Marciani said in a phone interview. Marciani said each school should have a safety and security evaluation at least once a year. Interscholastic athletics and after-school activities should be added onto the school's emergency operating plans. “I would say that we're good on emergency operating plans, but what is missing is the after-school concept inside the emergency operating plan, inside and outside the school building, at football practice or chess club. It could also be off-campus activities like proms. We're also thinking in terms of third-party rentals,” Marciani said. Third-party rentals would include nonprofits. Marciani recommends a school safety coordinator for both the school day and after school. Schools should require some kind of ID to get into buildings and surveillance at access points for sports and outside activities, Marciana said. At football games, “you need an officer there to pat people down and look through their purse. There should be some type of security available from a security company or law enforcement,” Marciani said. Further, he said, schools need to have some type of command setup. “If an event becomes an incident, how is their coordination between the local sheriff's office and the high school?” Marciani asked. He believes there are ways to pay for extra security measures through grants, ticket sales and charging rent. Bernie Beier, Allen County Homeland Security director, said school safety for outside and extracurricular activities is a team effort. “If anything has changed in the last 10 years, I think it's the information sharing. We've understood that lots of people have the piece of the puzzle to raise that child. The school safety issue answer always comes back to leadership and partnerships,” Beier said. His office confers monthly with representatives from all public, parochial and private schools at the Allen County School Safety Commission meeting to share ideas, safety measures and information. “Schools have recognized they have to share amongst themselves and then reach out to the community resources when appropriate to help those students,” Beier said. School officials recognize student interactions happen outside school, too. Though the school's “Friday night lights are heavily staffed by law enforcement,” he wrote, changes were to take place. For instance, only clear bags would be allowed into any high school stadium, except for diaper bags. All bags were subject to search. After the third-quarter kickoff, there would be no entry and no re-entry of anyone who left the stadium before the game was over. Loitering was to be prohibited outside the stadium. And once spectators left a game, they had to leave the campus. Additionally, home games would move to 6 p.m. Although earlier starts would not be popular, Fennoy predicted, more daylight would allow security to assess the crowd and empty parking lots earlier in the evening. “These changes are not just specific to football; the procedures will apply to other events in our stadiums throughout the year, and changes to gymnasium procedures will be similar,” he said. While each school district builds on to existing security efforts, Beier maintains that information sharing will keep everyone safer.